What a day! Final memberships to vote for leader of the new Conservative Party of Canada and to vote for my nomination are due tonight at midnight. As I’ve been working selling memberships for my nomination, I had the opportunity to speak with both the Kingston Whig Standard and to Rex Murphy on Cross Country Checkup on CBC Radio One. The Whig reporter called today to find out a little bit more about who I am and why I’m running. I mentioned that the new Conservative Party represents a chance for previously sidelined conservatives to be heard and that the formation of the party represents “a real opportunity for democratic change in this country”. On Rex’s call-in show, Rex introduced me to the country and again to Stephen Harper. Subsequently, I asked him the following question, “Hi Mr. Harper, I’m seeking the Conservative nomination here in Kingston and the Islands. I’m 23 years old and when we had the opportunity to meet and discuss the issues we didn’t have the chance to discuss youth issues. Now, I think that this new party can be the party of youth in this country and I’ve been working hard to realize this goal. I’d like to ask you what your commitment is for the sustainment of a youth wing of the party and whether you’ll be seeking youth input if you’re the leader.” Now, I know what I said, but I can’t begin to present Mr. Harper’s response without a transcript, so I’ll present the exchange when it becomes available from CBC. Update:I can do one better than a transcript. Here’s the audio of the interview with Stephen Harper. I’m on the air at around the 44 minute mark. “Why does the government not pull the flying carpet out from under the Prime Minister, cancel the $100 million order for the flying Taj Mahals and buy new helicopters for our troops, or has the little guy from Shawinigan become the sultan of Shawinigan? “The Minister of National Defence says that the new luxury jets are an upgrade to make sure that the government is better able to do its job when it is required to travel. The only thing the cabinet does fast is fly. “Why is the minister not more concerned about providing his troops with the equipment they need to do their jobs than he is about providing the Prime Minister with a Canadian version of Air Force One to feed his imperial-sized ego? I’d like to post a reminder to everyone that is interested in joining the new Conservative Party of Canada. The deadline for membership sales in order to vote for leadership is tomorrow (February 29th). You can, of course, buy a membership anytime after this date, but in order to participate in the leadership vote you must purchase a membership by tomorrow. Please note that the last date to purchase memberships to vote in the Kingston and the Islands Conservative nomination meeting is tomorrow as well. Thank you to all of you who have signed up through my website. I have been overwhelmed by your level of support. In order to process your membership application before the deadline tomorrow, please sign up through the Conservative Party of Canada’s membership sales webpage. You will still be able to purchase memberships after the deadline from my website, but for now please use the link above. The nomination meeting is on March 22nd and I hope to see all of you there. The new Conservative Party of Canada radio advertisements are out an I’d like to share them with you. I’m told that the French ones are coming out soon so stay tuned for those. If you’d like to help, please see the info below the ads. 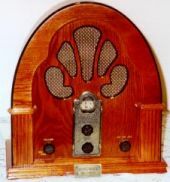 The average cost of a radio ad is about $116. If you want to ensure that these ads run on radio stations serving Kingston and the Islands during the next federal election, please consider donating to play these ads to help hold Paul Martin and his band of Liberals to account. A letter from Paul Martin? This letter came to me by email today. It’s a parody along the lines of the Nigerian email scam. Enjoy! FIRST, I MUST SOLICIT YOUR STRICTEST CONFIDENCE IN THIS TRANSACTION. THIS IS BY VIRTUE OF ITS NATURE AS BEING UTTERLY CONFIDENTIAL AND ‘TOP SECRET’. My name is Paul and I was the Minister of Finance in a corrupt one party state. Jean and I have $100 million dollars trapped in our joint account at a Caisse Populaire in Shawinigan. I urgently need your assistance in freeing these trapped funds. You see this corrupt one-party state isnt corrupt any more. Oh, no. We are an honest, transparent, forthright government committed to the highest ideals of government service. Together we stand on the edge of the future, where the politics of achievement will unleash potential hitherto unimagined. But first, there is the matter of the money. I have to get rid of it before the public inquiry finds it and I need your help. Do NOT send your banking information (What do you think this is, some Nigerian scam?). No, just bring a bunch of empty suitcases and take this letter to your local RCMP and they will set you up with a non-government account. They will close the account and destroy the evidence after the money has been transferred and you have packed the suitcases. You might want to rent a pickup truck to carry them. Do not worry about getting the police involved, they are on the side of the good guys. They have done this sort of thing before. Then all you have to do is take the money down to the port of Montreal and put in on the next CSL ship bound for the Caribbean, and the Captain will give you your commission on the transaction. You can recognize the ship easily; it is the one flying the Liberian flag. Oh, and you might want to bring a translator who knows a bunch a Third World languages. These ships are staffed with a bunch of illiterates, but once you have delivered the message they will know to which tax haven they have to go. They have made this run with the other $161 million. Posted on February 26, 2004 Author Stephen TaylorCategories OtherLeave a comment on A letter from Paul Martin? I just arrived home from the leadership debate in Ottawa and it was an interesting and enthusiastic day. The debate was a perfect showcase for our leadership contestants and a great showcase for our party. While Belinda Stronach, Stephen Harper and Tony Clement debated the issues, there was a consensus, indeed among the audience as well, that change needs to occur in government and that Paul Martin has lost his right to rule. Belinda Stronach started her opening statement in French and spoke confidently. She spoke with strength and poise during the entire debate and never faltered significantly. She certainly surpassed everyone’s expectations. 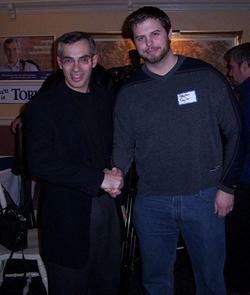 Tony Clement tried to show that he was in charge of the debate. He would often move the debate towards certain candidates, shifting the discussion. “Now Belinda, you assert that…”, “Stephen, I want to get back to that point”. Clement certainly had the most ease about him and he managed to share some wit as well. After listing his qualities, he rhetorically asked, “Now, who do you want for leader”, to which one Belinda supporter yelled out “Belinda!”. Tony laughed and concluded that he wouldn’t be asking anymore rhetorical questions. Stephen Harper discussed the issues. He kept referring to his record in parliament and his role in merging the two parties. 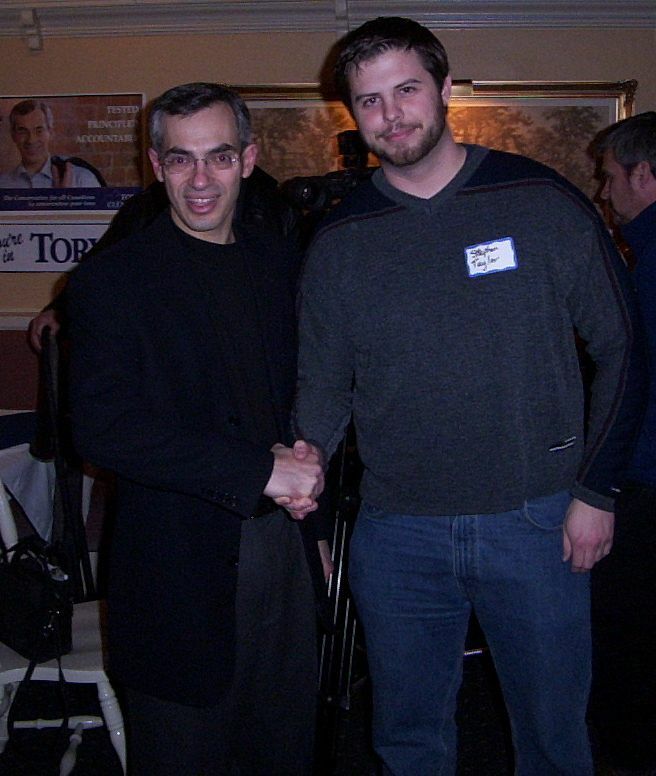 Tony Clement replied that contrary to Harper’s belief, he (Tony) and Belinda had every right to be there as Belinda was instrumental in joining the two parties together. The greatest criticism of Harper came as a concern that he will not appeal to Canadians outside of Alberta. The Stronach supporters and Harper supporters were out in full force, filling much of the hall. Clement’s supporters had a modest showing equaling roughly one third of either the Belinda boosters or the Harperites. There were many Conservative senators in attendance and Peter MacKay was also present. Harper’s supporters in the hall were of all ages, while about 90% of Stronach’s supporters, in the hall, were under 25. Belinda Stronach proposed a Youth Advisory Council where Parliamentary decisions could be guided by youth input. 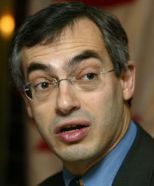 Tony Clement proposed a Parliamentary Budget Office where parliamentarians could do year-round research on the fiscal numbers proposed by the Ministry of Finance. All three candidates had a strong showing. The only clear loser appeared to be the Liberal party as the Conservative candidates underlined the Liberal scandals and arrogance every chance they got. There was no clear winner. Every candidate seemed to perform as they needed to perform. However, I would give a special nod to Ms. Stronach. Many of her detractors believed that she would have crumbled under the parliamentary debating experience of Stephen Harper and Tony Clement. However, she continues to impress and has clearly shown today that she not only deserves to be in the race, but also deserves serious consideration for the leadership of the Conservative Party of Canada. Tony Clement also was very impressive and showed that he is indeed somewhat of a scrapper and very capable debater. Stephen Harper didn’t present anything new and, as already said, relied on his record. However, Stephen Harper did have the most to lose, so his defensive yet consistant policy positions served him well for this debate. 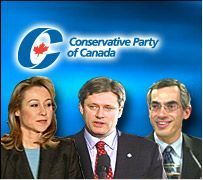 The leadershipship race for the Conservative Party of Canada today will feature a debate between Tony Clement, Stephen Harper and Belinda Stronach today on CPAC at 2pm. For those of you without cable I found a CPAC live webfeed. I’ve got tickets for the Ottawa debate so I’ll be reporting back here on all the details. I haven’t said too much about Tony Clement’s bid for leadership and indeed, my level of attention has been paralleled among most Canadians. However, I do believe that Mr. Clement does require a closer look. The man just might clinch this race, not by his visibility, not by his organization, but by his mere unthreatening image that he poses to the leadership candidates and to all Canadians. This leadership race is becoming polarized with Tony merely floating precariously in the middle. This contest, as it is, has become a “Stronach not Harper” or a “Harper not Stronach” race. We all know the story. Supporters of Belinda Stronach feel that she’s the most likely Ontario Tory to secure the race and they believe that a Stephen Harper victory will only reflect a Alliance takeover of the Progressive Conservatives. A Western politician, they believe, will be unelectable east of Manitoba. Conversely, supporters of Stephen Harper believe that Belinda Stronach’s inexperience in politics will present a liability to politics at home and politics abroad. The numerous admirable qualities of the two candidates each respectively outweigh the petty detractions but when the voters choose the leader, they’ll add up the negative aspects of the candidates and then decide. We should decide based on the positives, but it seems as though the negatives are more prominently etched in our minds. So, where does this leave ‘lil Tony Clement? He’s in the unique position were he can take the high road — not by choice, but because it’s the road less traveled. He’s correct when he said yesterday that he’s everyone’s second choice. Tony’s lack of visibility and Stronach’s knack for visibility makes Tony the second choice of Harperites, while his personal non-threatening nature and Ontario Tory roots make him the natural second choice among the Belinda Boosters. Indeed, enough Conservatives may add up the negatives of the two apparent front-runners and vote Clement as their first choice. These Conservatives may also believe that in an election, Tony’s unknown yet ‘non-threatening’ image may indeed draw voters who usually vote Liberal to vote Conservative because these voters couldn’t, in clear conscience, vote for the modern-day Liberal Party of Canada. Tony could indeed be the “anybody but” vote in both the Conservative leadership race and in the next federal election. This is Tony Clement’s greatest drawing factor and he knows it. An optimist would say that Tony Clement’s campaign has nowhere to go but up. If Tony does well in the debates, which is most likely, he may just surprise us all, himself included. Tony Clement is coming to Kingston on Saturday, February 21st. Mr. Clement will be speaking and meeting potential voters at Aunt Lucy’s Restaurant (Princess & Portsmouth) at 4pm. Update:I met Tony Clement at Aunt Lucy’s. Lou Grimshaw, our riding president, was nice enough to announce that I’m seeking the nomination in Kingston and the Islands. The first declared nomination contestant! 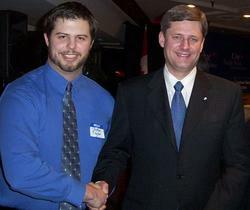 Yesterday, I met Stephen Harper in my riding of Kingston and the Islands. Mr. Harper was recruiting support for his leadership campaign and he addressed a room full of about 80 people. His speech was interesting and straightforward, underscoring his capability and accomplishments as Leader of the Opposition. In his speech, he informed us that Canadians have told him that the leadership race should not be a competition, but a choice. Indeed, I have always believed that the leadership candidates should focus on attacking the Liberals instead of each other. In my opinion, the victor should be the one who most effectively does this. However, I am confused as to why Stephen Harper would endorse Lois Brown, a nomination contestant in Belinda Stronach’s riding. Memorable moments: At one point during the evening, a member of the audience asked Mr. Harper to differentiate himself from the other candidates. Stephen Harper replied, in jest, that he is “male and tall”. Another memorable moment came when John Reynolds promised that if I get my nomination, they’d get me elected and on my way to Ottawa because the Liberal Party is falling apart across the country. Speaking of which, the Harper event was the official kick-off of my campaign. I worked the room talking to members about the leadership race and their concerns. At the end of the evening, I was interviewed by a reporter from the Globe and Mail. The reviews (and traffic) has been pouring in all thanks to my little spoof of the Liberal Party last Monday. My Liberal Monopoly gameboard has elicited laughter and a flurry email forwards and it has also sparked heated discussions at other websites. I’m glad that you all liked it. Now play nice, even though the other guys are cheating.